1. 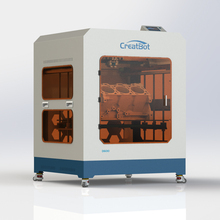 Metal Body: Creatbot 3d Printer is a full steel structure 3D printer, in addition to this, 99% parts of this printer are made of high strength or high tolerance materials that ensures high-precision printing, long term serve time and much better than wooden frame printer. 2.Large Build size: Build size is up to 300*250*300 mm (L/W/H), far more than other available 3D printer in the worldwide market. 3.Thermostat: With insulating cover for constant temperature printing space, preventing edge warping and deformation while large prototype printing. and the cover is easily removed. 4.Triple Nozzle: The extruder made by special materials and used advanced design technology, which is more stable and longer life. And can make 3 colors printing. triple extruder 5.Monocrystal Heated bed: Our 3d printer is used monocrystal material as the print bed, which can prevent the glass board be scraped, and confrim the model effect. What’s more, our bed can be heated, the max temperature is about 400 degree. 6.High precision: Imported bearing and rail, all parts made by CNC, accuracy of X, Y is up to 0.0127 mm, Z to 0.00125mm, and the minimum layer is only 0.02 mm. 7.Accuracy Feeder: Exclusively designed filament feeder, and using professional precision gear motor can ensure feed filament accurately. 8.High Speed: highest speed printer in the market, travel speed is up to 200mm/sec, and print speed is up to 120mm/sec, which are more than reprap and makerbot. 9.Various Filament: PLA, ABS, PVA, and other kind can be used. We support to use PLA, for no smell, environmental, degradable and easy to shape. 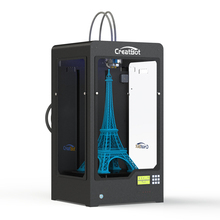 10.Self-researched Motherboard and Software Specification Creatbot 3D printer Specification 1. Model: Creatbot DX 02 2. Forming Tech. : Fused deposition modeling (FDM) 3. Extrude Number: Dual extruders 4. Build Size: 300*250*300 mm 5. Dimensions: 420*380*570 mm 6. Packing Size: 520*560*710 mm 7. Net. Weight: About 28 KG 8. Gross Weight: About 40 KG Tech. Parameters 1. Precision: X, Y 0.0127mm, Z 0.00125 mm 2. Min. Layer: 0.02mm 3. Nozzle Diameter: 0.4mm 4. Max. Travel Speed: 200mm/sec. 5. Max. Print Speed: 120 mm/sec 6. Max. Extruder Temperature: 400 Degree 7. Max. Hot Bed Temperature: 120 Degree 8. Max. Extrude Speed: 100mm/sec Filament 1. Filament Type: 3.0 mm ABS PLA PVA PS, etc. 2. Filament Temperature: 0~400 Degree 3. Filament Colors: Black, White, Red, Yellow, etc. Hardware 1. Controller: Arduino ATmega2560 R3Micro Controller 2. Mother Board: Creatbot Stable Main Board V3.x 3. Stepper Motor: X, Y 42*48, 1.3A 4. Stepper Motor: Z 42*63, 1.5A 5. Geared Motor: E 42*42, Ratio 1:10 6. Power Input: 110~220V, 1.5A 7. Power Output: 24V, 10.5A Software 1. OS: Win XP, Vista, Win7, Win8, Mac 2. File Format: STL, OBJ, GCode 3. Slicer: Cura, Slic3r 4. Print Software: Cura, Printrun, RepetierHost Application 1. Industry For the industry, 3d printer can be used for industry to make mould. 2.Eduction It can build up the model in low cost ,so it is the good choice for school especially for the mould making school. 3. Design You are a designer, and can use 3d software to make 3d model, then you can freely use our machine to print your design out.